After testing five of the best biodegradable shampoos and all-purpose soaps for pure cleaning power, we recommend the Sea to Summit Shampoo with Conditioner. It was the strongest dedicated shampoo we tested, and it left our hair feeling softer than the all-purpose soaps did. Plus it’s affordable, concentrated, and TSA carry-on compliant. Though it tended to dry our hair out more and needs to be diluted properly, another great option is our favorite biodegradable all-purpose soap, Dr. Bronner’s Pure-Castile Liquid Soap. 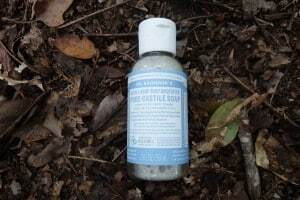 Dr. Bronner’s can be used to wash hands, face, hair, dishes, and clothes. It also packed the most cleaning power of any soap or shampoo we tested. Read on for our full reviews. Truth be told, there are surprisingly few biodegradable shampoos designed for camping and backpacking. In fact, Sea to Summit makes the only two we deemed worth testing. Of those two, the Sea to Summit Shampoo with Conditioner is by far the better option. We like the included conditioner which did its job decently well. It left our hair feeling softer than the all-purpose liquid soaps did. This shampoo is mildly scented and comes in a lightweight and durable plastic container. Unlike regular shampoo, it’s concentrated. I only needed a cap full (the recommended amount) to wash my hair. We also tested the shampoo’s cleaning power by soaking an oily plate in water mixed with a teaspoon of the stuff. Admittedly, it didn’t wow us. After five minutes about a third of the oil was still left on the plate. For comparison, even the worst biodegradable soaps we tested removed around 80% of the oil. Nonetheless we’ve given the Shampoo with Conditioner our Top Pick because it was easily the best dedicated shampoo we tested. Also we found pure cleaning power to be a detriment for some of the soaps. They can remove too much grease and oil, leaving your hair a little dried out. If the Sea to Summit shampoo doesn’t appeal to you, there is an alternative: Biodegradable all-purpose liquid soap. All-purpose soap can be used to clean almost anything, from hands to hair to dishes. Dr. Bronner’s has 18 uses, for instance, one being as a shampoo. In our guide to the best biodegradable soaps, Dr. Bronner’s came out on top. It’s affordable and packs lots of cleaning power. The company is also an industry leader in social responsibility and a certified B Corp. Understandably some of you might be hesitant to use soap as shampoo. I myself was skeptical at first. But in the name of comprehensive gear testing I tried it out. And the truth is it worked okay when diluted properly. Even when not diluted (diluting is difficult when backpacking) I reckon it will work well enough for most campers and backpackers — after all, we’re not known for being terribly picky about personal hygiene when in the backcountry. Just remember to use a tiny amount. We tested the Baby Unscented soap but Dr. Bronner’s Pure-Castile Liquid Soap comes in a wide variety of pleasant scents. Campsuds was the second-best liquid soap in our testing. 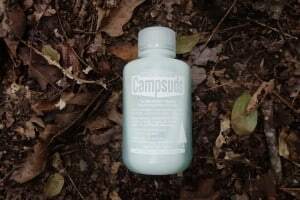 Like Dr. Bronner’s, Campsuds can be used to wash hair as well as hands, face, clothes, and dishes. Campsuds didn’t clean as well as Dr. Bronner’s but it’s a decent alternative. We liked the mild pine scent. It dried out our hair a bit but not too badly. Like most liquid biodegradable soaps, Campsuds is concentrated. Use it sparingly when using it as shampoo. Campsuds also makes a Bath Soap & Shampoo Formula formulated to wash body, face, and hair. We didn’t test it because it isn’t nearly as popular as the original formula, but it might be worth checking out. Wilderness Wash was the worst liquid soap we tested. It removed less oil from a plate than any other brand when we gauged each brand’s pure cleaning power. It’s versatile like the other soaps. The label states it can be used as body wash, shampoo, dish washing detergent, and clothes detergent. As shampoo it’s okay. Like you might expect it felt like we were washing our hair with soap. It wasn’t the best feeling. The classic version we tested has virtually no scent. But, like Campsuds, Sea to Summit also sells a citronella version that claims to help repel insects. At the end of the day Wilderness Wash isn’t terrible. We just don’t recommend it given the competition. If you’re looking for biodegradable shampoo sheets instead of liquid soap or shampoo, the Sea to Summit Pocket Shampoo with Conditioner is your best, and pretty much only, option. These sheets come in a small plastic container which easily fits into a pocket or backpack. They’re lightweight and TSA carry-on compliant. However they don’t clean too well. They left by far the most oil on the plate after soaking of any soap or shampoo we tested. Also, I have some gripes with shampoo sheets overall. During testing this type of shampoo proved it to be inconvenient to use. The sheets must be removed with dry hands or else you risk them getting wet and clumping together. To combat the clump you’ll need to either dry your hands completely mid-shower or pull out enough sheets beforehand. One Amazon reviewer mentioned mixing a few sheets in a plastic bag filled with water before showering and then shampooing with the sudsy water. While indeed clever, in our minds this is a workaround to an unnecessary problem — one that liquid soap and shampoo doesn’t have. Ultimately we found shampoo sheets to be an intriguing but rather silly concept. Feel free to try them if you’re curious, but we recommend sticking to liquid shampoo. 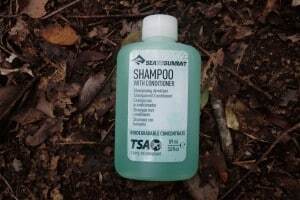 Bottom line: Do not dispose of any soapy water in backcountry water sources — even water with biodegradable shampoo. Instead, to dispose of soapy water, most biodegradable soap and shampoo brands and Leave No Trace principles recommend you pour it into a cathole that is 6 to 8 inches deep and 200 feet away from water sources. Be prepared to dig a cathole by packing a good camp trowel. Be prepared to carry water away from water sources with a pot, bottle, or water reservoir. Using regular shampoo in the backcountry can be a bit inconvenient. You need to gather enough water to wash with and then haul it 200 feet away from water sources. Once you’re done washing your hair you need to dig a cathole to dispose of the soapy water. Sometimes this is difficult to do. Maybe you’re somewhere with little to no running water. Maybe you’re in an area where catholes are discouraged. In these types of situations No Rinse Shampoo is a convenient alternative. As the name implies, No Rinse Shampoo requires no water to use. To ‘wash’ your hair with it you simply apply it, massage it in, then towel dry with an absorbent towel. It isn’t a perfect replacement for regular shampoo, but when I tested it out it left my hair feeling decently clean. No Rinse Shampoo is actually biodegradable. So if you do end up having water to wash your hair with you can always rinse and dispose of it in accordance with Leave No Trace principles. Liquid shampoo is the most common type of biodegradable shampoo. Sometimes it comes with conditioner. It works best for camping and backpacking trips where you’ll have access to water since it requires water to use. Shampoo sheets (aka shampoo leaves) are dry sheets of shampoo, sometimes with conditioner, that come in a small, pocket-sized container. To use, you pull out a sheet and dissolve it in water. All-purpose biodegradable liquid soap is a versatile alternative to biodegradable shampoo. Many brands of all-purpose soap can be used to clean not only hair but also hands, dishes, body, and clothes. It’s a multi-use item which means you’ll have one less item to pack. The downside is that all-purpose soap, while a powerful cleaner, usually doesn’t make the best shampoo. No rinse shampoo is another alternative to biodegradable shampoo. It requires no water which is ideal for certain trails and campsites. The downside is ‘washing’ your hair with no rinse shampoo doesn’t leave your hair feeling as clean as a regular shower would. Scented biodegradable shampoo generally smells great. The scents tend to be pleasant but not overbearing. Unscented biodegradable shampoo is recommended if you’re camping or backpacking in bear country because strong odors can attract wildlife such as bears. You should also go one step further and store anything with an odor in a bear-resistant container such as a bear canister or bear bag. Some campsites also have bear-proof lockers. What Does “Biodegradable” Even Mean? However, some marketers still use these terms deceptively. For instance, back in 2015 the FTC sent warning letters to marketers and sellers of dog waste bags for using potentially deceptive biodegradable and compostable claims. Thus it’s difficult to know whether or not a soap or shampoo marketed as biodegradable or compostable is actually so. Caveat emptor. Our advice: Buy from a brand you trust, use soap and shampoo in accordance with Leave No Trace principles, and consult ingredients lists to get a sense for what’s inside. Any shampoo will get out dirt and grease if you wash your hair hard enough, so the challenge we faced was to design a test that would test each soap’s or shampoo’s pure cleaning power. First, I filled a plastic tub with five quarts of water and one teaspoon of soap or shampoo. Then I brushed a teaspoon of vegetable oil mixed with food coloring onto a plate and soaked it in the tub for five minutes. Once the time was up I pulled out the plate. I repeated this process for each brand of shampoo and all-purpose liquid soap and then for the brand of soap sheets (using five sheets instead of one teaspoon). Finally, I visually inspected all the plates for remaining oil. The stronger the soap or shampoo, the less oil left on the plate. Feel free to visually inspect the plates for yourself in the two following photos. The leftmost plate in each is what the plates looked like before being placed into the tub. Our test results for the three brands of biodegradable all-purpose liquid soap. From left to right: Dr. Bronner’s Pure-Castile Liquid Soap, Campsuds, Sea to Summit Wilderness Wash. I also used the shampoos in daily life over the course of three weeks. When scoring, I gave preference to the biodegradable shampoos over the all-purpose soaps because the soaps left my hair and scalp feeling a little dry. H/T to Leigh Krietsch Boerner, whose excellent Wirecutter article on dish soap gave us the idea for how to test each product’s cleaning power.